With enthusiasm and full competence, we are successfully engaged in providing an exclusive gamut of Brass Male Couplings. The offered couplings are specially used for interconnection and branching applications in pipe systems in various industrial as well as commercial applications. These fittings are manufactured by our ingenious professionals using the best quality brass and advanced techniques. Additionally, clients can purchase these couplings at most economic prices from us. 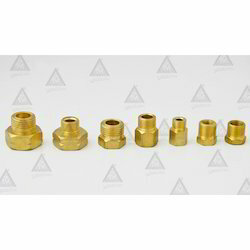 Being a quality-conscious organization, we are providing the best quality Brass Male Female Coupling. Under the visionary guidance of our ingenious professionals, the offered coupling is manufactured using the best quality metal and highly advanced techniques. Finding applications in automotive and engineering appliances, this coupling is made available in different sizes and finishes. 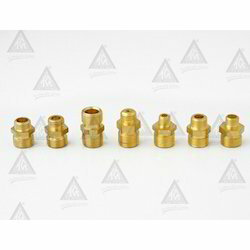 The provided coupling can easily purchased from us at most competitive prices from us. 3/8" Cu x 3/8" B.S.PPF. 1/4" B.S.PP.M. x 1/4" B.S.PPF.